#1 – Everyone Will Not Understand You…SO Stop Trying To Explain Yourself. Cast Vision…And MOVE Forward! #2 – Everyone Will Not Like You…So STOP Trying To Be Popular. #3 – You Don’t Have To Be The Person Who Actually Solves Every Problem….Admit You Are Not The Smartest Person and Let Your Experts Be Your Experts. #4 – Spend WAY More Time Talking About Who You Are Rather Than Who You Are Not. #5 – A Leader Is Always An Easy Target Because They Are…A Leader. So, Get Over Yourself And Get On With What God Called You To Do! #6 – When The Holy Spirit Presses Something Into Your Heart…Don’t Ignore Him. #7 – Do NOT Expect God’s Next Step To Make Sense. #8 – You Can’t Plan A Move Of God…But You Must Be Prepared For One! #9 – Do Not Resist Something Just Because You Do Not Understand It! #10 – People Who Claim You “Are Not Deep Enough” Are Obsessed With Information But Have No Desire To Live Out Transformation. #11 – You Don’t Need To Listen To Everybody…But You Had Better Be Listening To Somebody Because God Didn’t Ask You To Take This Journey Alone. #12 – Never Apologize For Asking People To Commit To Something…Jesus Didn’t! #13 – The Church Has Been Underachieving For Way Too Long…So Dream BIG And Don’t Apologize For It. #15 – The Gospel Changes Lives…PREACH Every Sermon Like It’s Your Last!!! 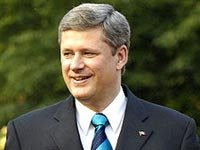 "In a notably personal interview in Quebec City, Prime Minister Stephen Harper explained that God's judgement on his life was more important to him than the judgement of history. The story will be published in the September edition of Prestige magazine, reports Patrick B. Craine, LifeSiteNews.com. His comment came while speaking about his family, saying that his relationships with his wife and two children are more important to him than political accomplishments. "The important thing, for me, is to preserve family ties," he said. "I can win elections, but if I lose my family, it's a disaster." "To be honest with you," he continued with a laugh, "I am a lot more concerned by God's verdict regarding my life than the one of historians." Confident Islam conquers relativistic Europe? Europe is no match for Islamic self-confidence: "When an insecure, malleable, relativistic culture meets a culture that is anchored, confident and strengthened by common doctrines, it is generally the former that changes to suit the latter."